I love this recipe because on any brain dead morning, or lets be honest, usually evening, you can whip it out with zero forethought. Now I know you can do that all the time if you use a pancake mix, but if you are trying to cook with whole grains with no storebought nasty fillers...this is your number (you don't even have to have your wheat ground ahead!!). 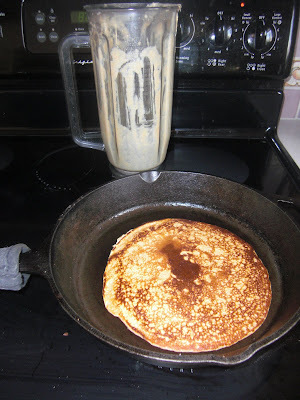 If you have a blender you can make it happen! Put milk, water and grains in blender. Blend on highest speed for 3-5 minutes, or until batter is smooth. Add remaining ingredients and blend on low. You may need to add 1/2-1 c of additional water to make batter to your preferred consistency. Bake on a hot cast iron griddle. Double the oil for a great waffle batter. I just made these this morning and they were great! Thanks for all the healthy recipes. I actually have made quite a few of your recipes and I have never commented, but I thought it was about time. I really appreciate all the recipes and information!